File image of a US Navy P-8. Boeing’s P-8A Poseidon maritime surveillance aircraft is set to enter RAAF service from 2017 after the federal government approved the acquisition of eight and options on a further four. The decision was announced by Prime Minister Tony Abbott at Fairbairn Defence Establishment, Canberra Airport on Friday morning, and is the first major defence acquisition from the new Coalition government. “The first aircraft will be delivered in 2017, with all eight aircraft fully operational by 2021. The government has also approved an option for a further four aircraft subject to the outcomes of the Defence White Paper review,” the Prime Minister said in a statement. 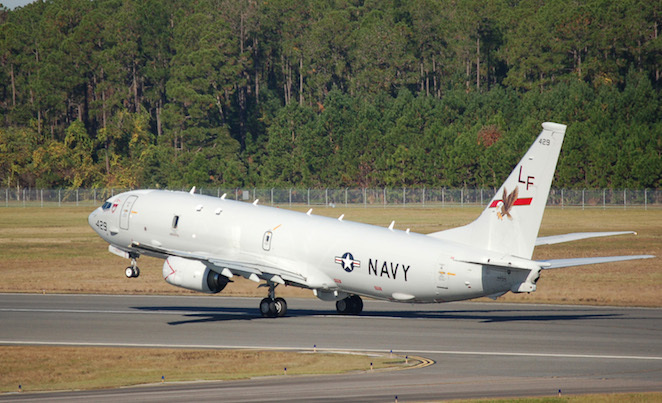 The acquisition of the eight P-8s, under AIR 7000 Phase 2B, has a budget of $4 billion. Facilities work to support the P-8, primarily at Edinburgh, will cost “as much as” $1 billion, the PM said. Acquisition of a complementary high altitude long endurance (HALE) UAV under AIR 7000 Phase 1B remains under consideration, with Defence Minister Senator David Johnston telling media at Fairbairn that Northrop Grumman’s MQ-8C Triton is “a very viable option”. The numbers and timing of any Triton acquisition remain in question, however. Original AIR 7000 planning anticipated the acquisition of eight P-8s and seven HALE UAVs to replace the AP-3C, but if more P-8 options are exercised fewer UAVs are likely to be funded. A US Navy P-8, visiting Australia for exercises with the RAAF and RAN, was in Canberra for the announcement. The RAAF currently operates 18 AP-3Cs from Edinburgh with 92 Wing’s 10 and 11 Squadrons. Well, nothing really surprising here. The 4 options are good to see, I wonder if they are *also* bit of insurance against any delays/problems with the UAV element or it’s RAAF introduction? Also, it will be interesting to see how the squadrons are used. Perhaps 10 squadron will take the P-8s with 11 squadron moving to the UAV after the last of its P-3s are retired. Bloody good news! Now lets see high vis marking return to the P-8s just as the other P-8 operators are doing! Logical decision based on maintenance saving with B737 platform with BBJ’s and Wedgetails already in service. I question whether 8 is anywhere near enough, given the size of our maritime approaches and lines of communication and possible / credible ASW threats. Keep in mind we’ll never have all 8 of these P8s serviceable and available for ongoing operations simultaneously. This is pie-in-the-sky fantasy. We need at least 2 operational squadrons of fixed-wing, MANNED maritime patrol/ASW aircraft plus the training and support elements. Sorry, but UAVs cant do ASW and are not necessarily a cheaper option. They require a huge number of people to keep them operating – just because the crew is not on board, there is still a crew sitting in some cabin somewhere still making the same decisions required and the maintenance is probably more intensive than that requred for manned aircraft. They are NOT necessarily an economical let alone effective offensive platform. The P8 may well be a good platform – it has huge shoes to fill replacing the venerable P3 Orion, but having just 8 aircraft is just folly for the ADF. I am still to be convinced that the P3 is still not the best platform for fixed wing ASW/Maritime patrol – especially over the vast areas of ocean we have requiring long endurance and flexibility. Should the option for a further four P-8’s be approved, what will be the likely number of HALE UAV’s acquired? Is there a minimum feasible fleet number? The number of Tritons being talked about is 6. Operationally, you have to question why the RAAF is running this squadron instead of the RAN. Given the US operates these via the US Navy, you would have to think that it’s role, connectivity and interoperation would be best aligned with RAN assets. I know that it is not “supposed” to matter in an interconnected defence force, but anyone with operational experience can tell you that it does matter. Chain of command is the major barrier to inter-operation – particularly between the MH60-R and the P8 crews who are most likely to be working together. Whether it is SAR or ASW, having these state of the art assets working well together will always be sub-optimal for as long as they are not in the RAN chain of command. Buying off the shelf is a great strategy for US interoperability and cost savings so why do we always knee cap ourselves by doing things different! Like it or not, the RAN did away with its own fixed-wing aviation branch in 1982, and has never really operated anything that was permanently land-based. If you think the P-8s and Romeos are going to be “disconnected” with current CONOPS, imagine how long it would take the RAN to grow a whole new cadre of fixed wing operators from scratch and what affect that would have on operations for the next 20 years. Andrew weren’t the Seasprites permanently land based? Thanks for your input Andrew – 12 P-8’s and 6 MQ-8C’s instead of 8 P-8’s and 7 MQ-8C’s seems much more sensible and a better mix; hope this is what eventuates. That’s be MQ-4C, the MQ-8C is the Fire Scout VTUAV. Got to agree with son of Neptune, How does eight – twelve aircraft with a few uav`s thrown into the mix actually replace the two fully equipped squadrons that have been the cornerstone of our maritime operations for over 40 years. Ok advances in technology might fill some holes, And the crews may appreciate being home a little more while a uav does the dull boring observation work however they will still need to go out and investigate the contact and I`m pretty sure that eight to twelve P8`s are not going to be able to cover everything that SRG does on a daily basis as well as unforseen contingincies that can pop up unexpectedly. One question though and yes I know the Wedgetail was purchased for awacs duties but doesn`t the E7 have a surface search function in it`s radar. Surely if the E7`s are out and about in the same area are we not just duplicating a surface search function with uav`s performing the same tasks as wedgetail and Jindalee OTHR.